February is the one month of the year that many of us associate with love and romance. We cut out paper hearts for Valentine’s Day cards and wrap-up cut flowers for that special person in our lives. But there is another reason to celebrate. February 14th is also Oregon’s birthday! Way back in 1859, Oregon became the 33rd state. So consider giving a birthday gift to Oregon, by controlling our February Weed of the Month, Scotch broom! Scotch broom (Cytisus scoparius) is one of the most damaging weeds to Oregon. 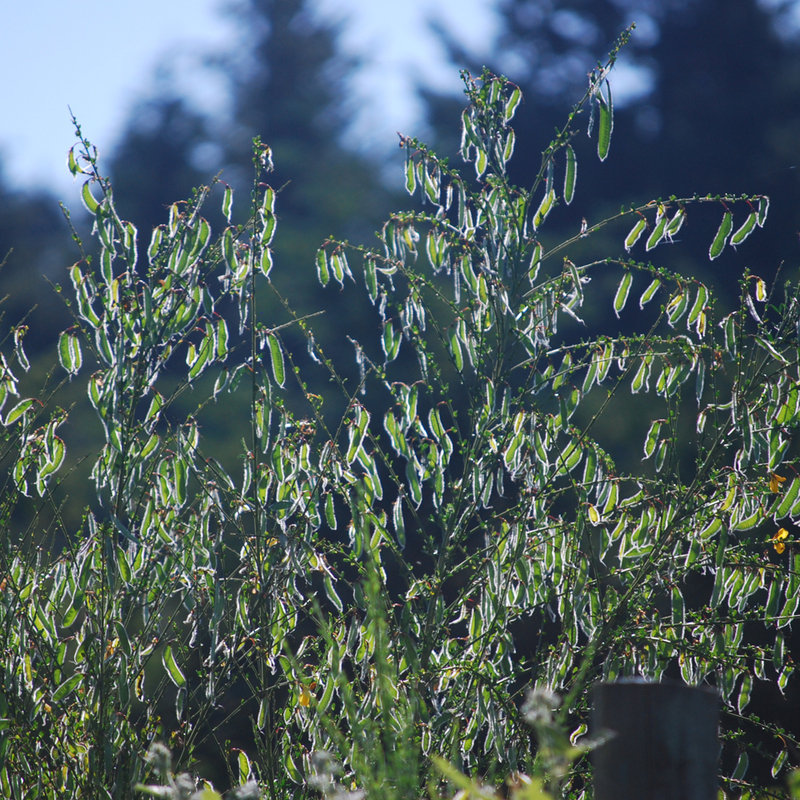 A recent analysis of economic impact from noxious weeds in Oregon found that Scotch broom alone results in a loss of $39.5 million in personal income to Oregonians. Unfortunately, as a class B noxious weed Scotch broom is a relatively wide-spread invasive weed in our area. Originally introduced as an ornamental shrub and as a dune stabilizer Scotch broom is now one of our most widespread weeds. Scotch broom is an attractive evergreen shrub. It has many slender, erect, dark green branches with small leaves up to half an inch long. It grows from 3 to 8 feet in height. In late April through early May, it is covered with bright yellow, pea-like flowers. The flowers mature into flattened seed pods that contain up to a dozen seeds each. Dried pods will crack and pop open in mid-summer and eject the seeds spreading them further. How is Scotch Broom Invasive? Scotch broom is an opportunistic and aggressively prolific invasive plant. A single plant can produce well over 20,000 seeds a year that can last in the soil for more than 30 years (some estimates are as long as 80 years)! Scotch broom easily invades disturbed sites, natural areas, dunes, and forest lands. This weed displaces native and beneficial plants and smothers tree seedlings, hampering reforestation efforts. It causes loss of grassland and open-forest habitat. Flowers and seeds are toxic to humans and most animals. Scotch broom is also highly flammable and can dramatically increase wildfire intensity and frequency. 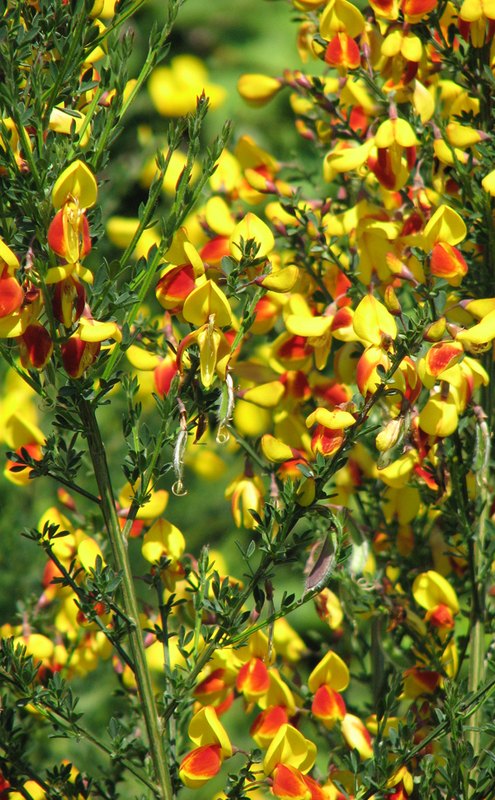 Scotch broom can be controlled by various methods depending on the severity and the location of the infestation. For small infestations, plants can be pulled or dug. Large plants can be cut between flowering and seed production. large plants generally won’t resprout following cutting, but it is typical to see a flush of new seedlings following removal of large Scotch broom stands. When removing plants, avoid putting any plants with seed pods in compost or yard waste as they can potentially spread plants further. Instead, plants should be bagged and disposed of as trash. If you feel enamored by the ornamental qualities of Scotch broom, we recommend looking at non-invasive alternatives with similar yellow blooms for spring color. In celebration of Oregon’s birthday, we can’t help but recommend the Oregon state flower, Tall Oregon Grape (Mahonia aquifolium). The false-spring we often experience in February is a great time to control Scotch broom by pulling. Moist soil makes it easier to pluck young broom plants out of the ground. For older, more mature plants, we recommend trying one of the tools from our Weed Equipment Library. These tools are available for use at no charge to landowners in Clackamas County. Please be sure to contact us to check in on availability and to reserve your tool today. For additional information about how to control Scotch broom, please check out the WeedWise program Best Management Practices guide for Scotch Broom more information!